Polish rabbi and author; lived at the end of the eighteenth and at the beginning of the nineteenth century; grandson of R. Kalman of Byelostok. He was rabbi and preacher at Prassnysz, in the government of Plotzk, Poland. 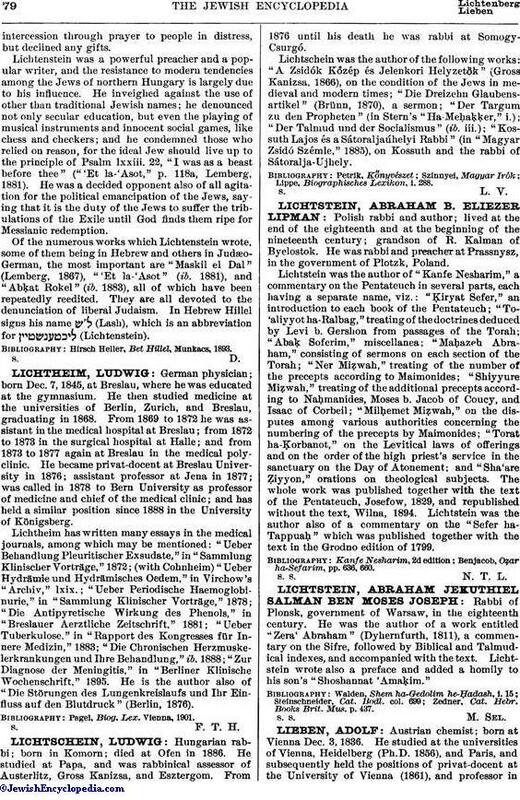 Lichtstein was the author of "Kanfe Nesharim," a commentary on the Pentateuch in several parts, each having a separate name, viz. : "Ḳiryat Sefer," an introduction to each book of the Pentateuch; "To'aliyyot ha-Ralbag," treating of the doctrines deduced by Levi b. Gershon from passages of the Torah; "Abaḳ Soferim," miscellanea; "Maḥazeh Abraham," consisting of sermons on each section of the Torah; "Ner Miẓwah," treating of the number of the precepts according to Maimonides; "Shiyyure Miẓwah," treating of the additional precepts according to Naḥmanides, Moses b. Jacob of Coucy, and Isaac of Corbeil; "Milḥemet Miẓwah," on the disputes among various authorities concerning the numbering of the precepts by Maimonides; "Torat ha-Ḳorbanot," on the Levitical laws of offerings and on the order of the high priest's service in the sanctuary on the Day of Atonement; and "Sha'are Ẓiyyon," orations on theological subjects. The whole work was published together with the text of the Pentateuch, Josefow, 1829, and republished without the text, Wilna, 1894. Lichtstein was the author also of a commentary on the "Sefer ha-Tappuaḥ" which was published together with the text in the Grodno edition of 1799. Benjacob, Oẓar ha-Sefarim, pp. 636, 660.